Treatibles 750mg. dropper bottles contain phytocannabinoid rich (PCR) oil extracted from whole plant medicinal grade hemp grown in the USA. In addition to several therapeutic phytocannabinoids, terpenes and flavonoids are included creating what is known as the entourage effect, providing a full spectrum of benefits for pets. 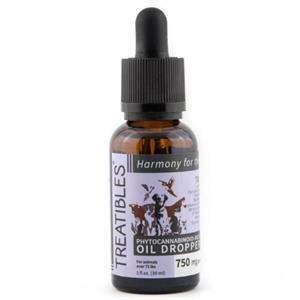 Treatibles ensures the purest, most effective, non-psychoactive and non-toxic PCR oil. MCT Coconut Oil as used as the basefor this product. Coconut oil has antiviral, antibacterial and antifungal properties. In addition, coconut oil contains antioxidants and is rich in lauric acid. Combined with the many benefits of PCR oil such as instilling calm and balance, reducing discomfort, increasing appetite, addressing seizures, supporting the body’s inflammatory response and more, makes it an excellent formula with both internal and topical applications. As a topical remedy, Treatibles PCR and MCT coconut oil can help reduce discomfort, manage burns, help in the healing of rashes, infections, cuts, scrapes and blemishes. Lauric acid is recognized for re-establishing the skin’s acid balance without drying.